The Gn'rthan people were peace loving and not warlike. Because of that they were ill equipped to deal with the invasion of the Jvaran Empire. The Gn'rthan are fighting a losing battle on all fronts as the Jvaran Divine Navy continues it's attack. The Jvaran's use a strange fungal weapon that infects machinery and computers, taking them over... Karth Solemu is a test pilot and decides in desperation to ask Central, the AI of the Gn'rthan civilization, to build him a ship from one of the factories. Advanced in weaponry and maneuverability, Karth names his new ship "Faith" and prepares to confront the Jvaran forces with it. As Karth launches his fighter into space, transmissions from Central go silent and the remaining machines revert to simple programming. 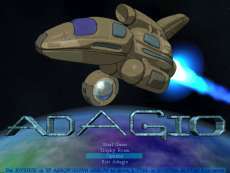 Adagio is a horizontally scrolling shooter game. Players take the role of Karth Solemu in his ship Faith. As the screen scrolls towards the right, Karth will encounter enemy ships. To destroy them, Faith has a primary weapon, which can be upgraded via power-ups to different types including: Blade Laser, Spread Beam and Wave Cannon. Additionally the Faith has a secondary orb weapon which can be deployed and recalled. When deployed the orb homes in on enemy vessels and destroys them, however the temperature gauge increases and the orb must cool down before doing additional damage. When recalled, the orb rotates around the faith, absorbing enemy projectiles and destroying nearby enemy vessels. During each level, trophies can be found and collected. Gaining the necessary amount of trophies allows the player to activate cheats and special modifications to the game, such as extra lives or "Disco Fever" mode.